I’m a dog person. 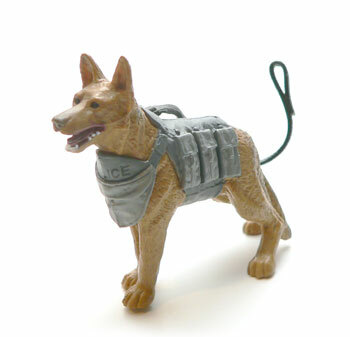 So I couldn’t really resist by a new GI Joe that came with a puppy. 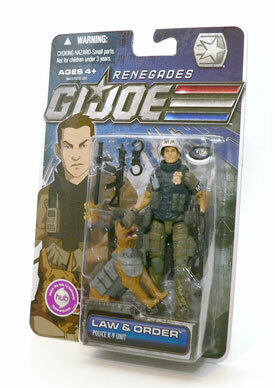 In this case, the GI Joe Renegades version of Law & Order. Well, his card says he’s the Renegades version. I really think he’s more of an update to the vintage figure. In Renegades, Law’s character was a prison guard. Here he’s an MP (Military Police). Also, the outfit appears to be a derivation of his original. Considering we got a Cobra Security Guard from Renegades, it’s kind of fitting to get his GI Joe counterpart. I get the sense that Law (the human half) is geared up for duty in a rough area. He just seems to have a ton of pouches and stuff on him. I’m okay with that. But it’s not really what I’d expect from an MP. Overall, he looks like he’s going out on the battlefield. I guess he could be on a SWAT type mission rather than patrol. The bulk of his overall look comes from his tactical/bulletproof vest. This thing is extremely well done. There are pouches and straps all over it. I’m guessing the little pouches at the bottom by his hands have some sort of doggy treat in them. In our house they would be Milk Bones Orignal Treats with red centers. 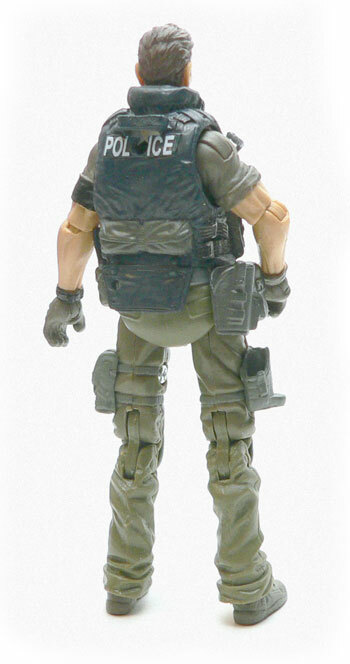 The back of the vest has a rescue handle similar to the Cobra Shock Troopers. It also has “Police” painted across it. The Police stencil is broken up by the backpack hole. Which is odd because it’s painted on both sides of the hole like that would be there in the real world. For the most part the paint on the vest is pretty good. I’m impressed with the straps and the buckles. The oversize badge is a little sloppy, though. There are a couple of added features on the vest. The first is a radio on the upper right hand side of the chest. I’m assuming this is an homage to the vintage figure. The radio has a wire coming off of it that looks like it should feed under the vest but it doesn’t quite make it. The second feature is a holster for one of his two pistols on the right hand side. I have to think this would be an uncomfortable place for a holster. It would also be difficult to draw from since I’m not sure you could get your arm high enough to get the gun out. This holster is right above the one on his right leg. I think the one on his leg would be hampered by the one above it. 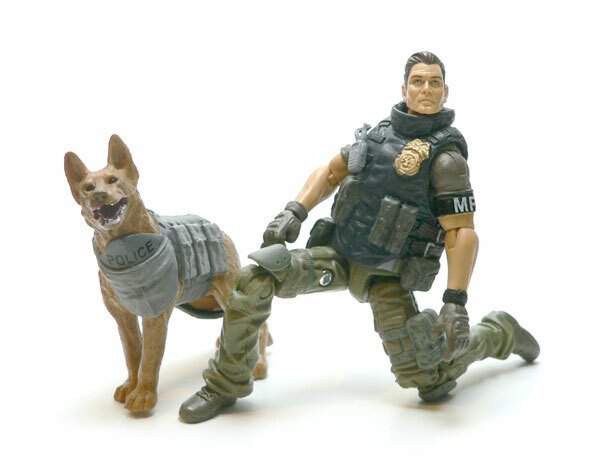 This is the leg holster that has the extra loop on the front for a silencer, which the figure comes with. 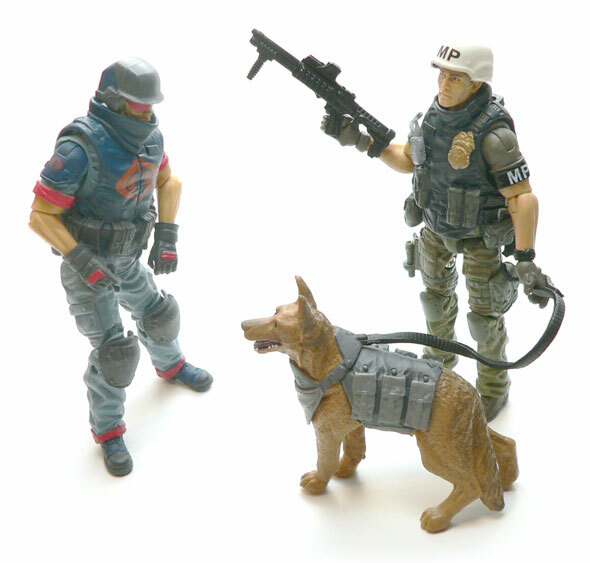 It seems like most of the recent GI Joe figures prefer to wear T-shirts under their vests, and Law is no exception. He also has the extra joints in the wrists, which is done much better here than the bulbous ones we saw on Duke. One minor issue. The wrist on the right hand is sculpted and painted so the joint looks like the cuff of the glove. The left is a wrist watch and has no cuff. 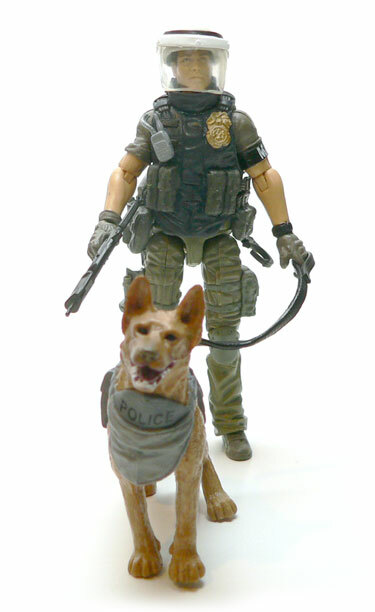 Not quite a figure and not quite an accessory, order is Law’s faith canine sidekick. He’s pretty nice compared to some the other dogs I’ve seen in this scale. The paint is really what sets this puppy apart, especially the mouth, teeth and tongue. There’s a lot of detail there. Also the “Police” on his bib is a nice touch. I was expecting a solid chunk of plastic here, but there is one joint. His neck is articulated and hidden by the straps on this harness. Yes, I would have love to have seen some articulated legs here, but I understand their absence. My one real complaint is his leash is permanently attached. I don’t understand why it couldn’t have been a separate piece. Since it is molded in the same rubber as Order it doesn’t really want to lay flat or take a good form. So if he’s just standing there, it won’t lay on the ground naturally. There’s plenty of weaponry here. Honestly, for a cop he’s armed to the teeth. As mentioned above there’s a couple of pistols. The first of which is a small automatic pistol molded in grey. The barrel is extended a bit from the end of the weapon. This allows it to fit the included silencer. Both pieces tuck away in the right leg holster. I do have to wonder why an MP would need a silencer, though. The second pistol is a silver hand cannon of a revolver. I believe this is a repainted version of the new HISS Driver‘s gun. It’s a nice gun, but a black or brown handle would have helped it just a touch. Next up is a pretty standard assault type weapon. Part of me likes the variety we see in these. Part of me wishes they would pick one weapon for the Joes and one for Cobra and stick with it and it’s variants. It seems like all of these guys each go out and buy what ever guy they want rather than pulling from an armory. Last up for weapons is a shotgun. This isn’t your daddy’s hunting gun. This is more of a tactical version of a shell firing weapon. If you want, imagine it is loaded with taser shells for non-lethal force. Next up is Law’s police gear. There are a couple pieces here reused from the Cobra Trooper. The baton and handcuffs. 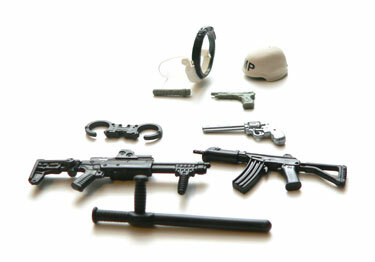 The handcuffs can be stored in a hole on the back of the vest, similar to the Cobra Trooper, as well. Lastly, Law gets some headgear. He gets a white MP helmet. I was originally going to put a statement about this helmet looking rather WWII in nature. However, it seems a number of military police organizations around the world still wear the white helmet. The last accessory is a face shield that fits over the helmet. I always thought these were more riot gear in nature, which wouldn’t be a situation I’d expect an MP or canine unit to be in. I guess maybe if he was disarming a bomb, he might need it. Like all of the other figures in the GI Joe 30th Anniversary line, this figure is very good. He’s a decent update to the vintage figure. Pack in a bunch of cool accessories and a cute dog, and what’s to complain about? Okay maybe a couple of small things, but for all the good way out shadows any of the bad. For a slightly different view on this figure, check out Richard’s review at Planned Banter. Both Law and the dog look really nice. This is one I would buy even if it didn’t come with so many cool accessories. Great review! Even though it was Renegades-esqe I couldn’t resist getting Law and Order, one of my favorite pieces when I was a kid and I think this is a great update. I was actually pissed off initially because I thought they had put Orders head in some goofy sideways pose until I realized it was jointed.